The Atacama Large Millimeter/submillimeter Array (ALMA), which consists of 66 antennas placed on the Chajnantor plateau in the Chilean Andes, has already produced impressive results for a large range of astronomical objects. Regular observations of the Sun have been carried out for the first time in December 2016 and exciting results can be expected soon. ALMA combines high spatial, temporal, and spectral resolution with the diagnostic advantages of radiation at millimeter wavelengths, which makes the array a powerful tool for addressing a broad range of fundamental scientific questions in solar physics (Bastian 2002; Karlický et al. 2011; Benz et al. 2012). 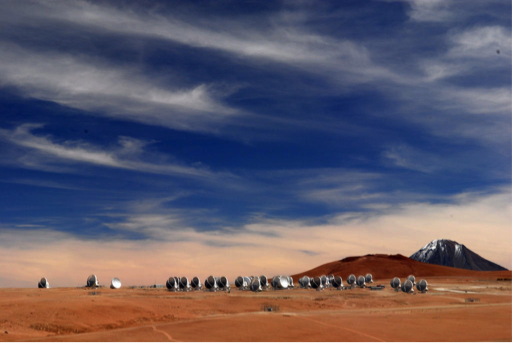 A short technical description of ALMA and an overview of potential solar science cases are presented in a review composed by the SSALMONetwork (Solar Simulations for the Atacama Large Millimeter Observatory Network, Wedemeyer et al. 2016a) and in papers referenced therein. In the current observing cycle, ALMA observes the Sun in Band 3 and Band 6 at wavelengths around 3.0 mm and 1.3 mm, respectively (see also Wedemeyer et al. 2016b). In future cycles, up to ten receiver bands will eventually cover a range from 0.3 mm to roughly 1cm. The continuum radiation at these wavelengths originates mostly from the chromosphere with the formation height increasing from the low chromosphere at the shortest wavelength to the top of the chromosphere at the longest wavelengths. ALMA’s different receiver bands with their up to some thousands spectral channels thus effectively map different layers in the solar chromosphere. The brightness temperature of the observed radiation continuum is closely related to the actual plasma temperature in the mapped layer and thus provides a plasma diagnostic that, in principle, is much easier to interpret than hitherto accessible chromospheric spectral lines (e.g., H alpha, Ca II and Mg II lines). Already the first regular interferometric observations are carried out with a cadence of 2 seconds, while the (up to 4) Total Power (TP) antennas are performing fast scans of the whole solar disk. The resulting TP maps can be combined with interferometric data to derive absolute brightness temperatures but are also interesting in themselves. The currently implemented solar observing modes deliver high-cadence time sequences and mosaics with an angular resolution of 1 arcsec or better, which is an enormous leap for this wavelength range, practically guaranteeing exciting results. ALMA offers new scientific possibilities for basically all science cases that involve the solar chromosphere. Among them are fundamental cases concerning the magnetic and thermal structure and the energy balance and heating of the solar atmosphere. The cases discussed in the review by Wedemeyer et al. 2016a include flares, micro- and nanoflares, chromospheric oscillations and waves, the fine-structure of prominences and coronal loops, coronal rain, and a multitude of other dynamic events in Quiet Sun regions and Active Regions. Already in its first solar observing cycle, all ALMA observations are co-ordinated with other space-borne (e.g., IRIS, Hinode) and ground-based telescopes (e.g., SST, NST, DST) thus resulting in rich data sets consisting of complementary information usually covering all layers of the solar atmosphere. ALMA contributes here with brightness temperature maps that will give much more direction information on the plasma temperature in the mapped layers at unprecedented resolution (for the mm range). Another interesting fact is that ALMA does also observe other stars and thus facilitates solar-stellar studies using the exact same instrument. The spatially resolved observations of the Sun’s chromosphere can thus be compared to (spatially unresolved) observations of a sample of other stars. The combination of detailed spatially resolved information with a large range of stellar parameters will certainly help to advance our understanding of stellar atmospheres. While already the first solar observing cycle is promising, it is only the beginning with many future ALMA upgrades ahead. Among the most important upcoming capabilities are polarization measurements, which can be used to derive the longitudinal component of the magnetic field vector in the same layer as the continuum radiation. ALMA might thus soon offer measurements of the magnetic field in the chromosphere, which has enormous scientific potential. Furthermore, ALMA might be able to observe radio recombination and molecular lines at millimeter wavelengths, which are poorly known but potentially carry rich complementary information about the thermal, kinetic and magnetic state of the chromospheric plasma and possibly adjacent layers. ALMA’s diagnostic capabilities open up a new complementary window on our Sun. First test results and now regular observations suggest that ALMA will become and – in view of future upgrades – remain one of the major workhorses for solar physics for the coming decades.